Fullback Marian Motley wore black high top chucks. NFL pioneer Motley: A gentleman fullback Marion Motley was the precursor of Jim Brown, a not-so-subtle warning to the NFL that a new breed of running back was right around the corner. Motley, a fullback, was big — 6-foot-1 and 240 pounds — brutal and, unlike baseball’s Jackie Robinson early in his pro career, had a tendency to rail against the racial hostility that surrounded him on the field. When players drove their cleats into his hands after he’d been tackled, Motley rose speaking hot words while burning in his memory the number on the culprit’s jersey. At the bottom of a pile, when opponents gouged his groin, Motley, also a linebacker, remarked to his tormentor: “If I don’t get you now, I’ll get you later.” While he gave as good as he got on the football field, he was an absolute gentleman in all other endeavors. Football and the world lost big Sunday when Motley, 79, died of prostate cancer after battling the disease for a year. He rushed for 4,720 yards in nine seasons (1946-55) in the All-America Football Conference and the NFL. 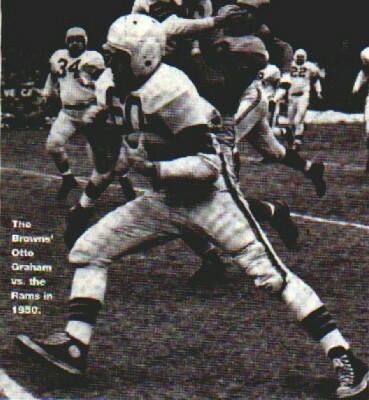 Motley led the Cleveland Browns to four straight AAFC championships from 1946 to ’49 and an NFL title in 1950 when he led the league in rushing with 810 yards. He played at South Carolina State and Nevada-Reno before turning pro. Motley was one of the first African Americans to play professional football in the modern era. Fritz Pollard started his career in 1920 and other blacks followed him, but there was an unspoken ban on blacks in the 1930s and 1940s. In 1946, a year before Robinson became Brooklyn Dodgers president Branch Rickey’s grand experiment, Motley and Bill Willis signed with Cleveland. Woody Strode, who would later gain more attention as an actor, and Kenny Washington signed with the Los Angeles Rams. That side of Motley often surfaced when he was greeted by young, smiling faces. It never occurred to Motley not to sign an autograph, not to share a moment of his time, not to express his profound thankfulness for his station in life by brightening the life of another. True, he was rugged and fierce as a player, often flattening would-be tacklers like a bull gone mad. He led with his head when helmets had no face masks. But that ferocity was but a tool of his trade and a sign of his determination. It was not his soul. His soul was gentle. Moore, who rushed for 5,174 yards with the Baltimore Colts from 1956 to ’67, didn’t know he was about to make a friend for life when he and some of his Nittany Lions teammates decided to see if they could lay eyes on a professional football player. Penn State was in Pittsburgh to play the Panthers at the same time the Browns were there to face the Steelers. Moore found out where the Browns were staying and decided to see who he could see. And did he ever see. “Marion Motley invited me up to his room,” Moore said. “And he sat down and talked to me. He wanted to know about me -- and did I have any thoughts about going into professional football? He talked to me, and I mean really talked to me.” That meeting, and a similar talk with Chicago Bears running back Ollie Matson (who finished his career with the Eagles), had as much to do with his success with the Colts as anything else, Moore said. When Moore was summoned to the podium in Canton, Ohio, for a few words when he was inducted into the Pro Football Hall of Fame in 1975, he had no speech prepared. Then he looked into the audience and saw Motley and Matson. Even with the racism that Moore and Blockson saw, they said they couldn’t imagine what it must have been like for Motley in the pros. When Moore asked Motley about the racism he faced in pro football, the pioneer would simply say: “I didn’t let it get to me.” It was clear to Moore, however, that it had bitten a huge chunk out of the man’s heart. Once when the Browns were scheduled to play a game in Texas, Motley received a threat that he would be shot if he set foot in the end zone. Born in Leesburg, Ga., in 1920, Motley told Moore he had seen some pretty gruesome things and wasn’t very trusting when it came to threats from whites. Not only did Motley face hostility from opposing players, his own teammates were hostile to him at times. Moore simply called him Superman. Hall of Famer Otto Graham was another Cleveland Brown who wore black Chuck Taylors. If you have an article or other information about an athlete who wears Chuck Taylors to submit to this website, please contact us at mail@chucksconnection.com.